It’s true: my current bread baking frenzy, coupled with Rick’s keen eye for a bargain, indirectly scored us $68 in sterling silver today. As you can imagine, there are many serendipitous twists and turns involved in today’s post, plus yesterday I promised to reveal our secret retirement funding idea today, so I will do my best to keep things as simple as possible. Point #1: The follow-up to yesterday’s promise to reveal how we will use this blog to fund our retirement, which is only tangentially related to spelt and silver, but a promise is a promise. We recently stumbled on a website called “Pictage.com” which allows photographers to display their work to potential clients without putting their images at risk of being swiped and used without artist attribution or (gasp!) compensation. Also, people have sometimes (not always, but sometimes) commented sweetly, “Hey! That’s a nice shot! It would make a great print / greeting card set / calendar / coffee table book / etc!” Based on all the above, we decided to open an account and, going forward, post all the photos we share here, there. We’ll also go backward upon request. If there’s a photo in past posts that you’d really like to cardify, let us know. Also, if the winter proves particularly long, and we run out of things to do (HA! ), I’ll spend some time digging through the archives and put together a “best of” collection. This will add an additional couple of steps to the whole blogging thing, and, okay, it might not totally fund our retirement, but if Rick and I can afford a six-pack of wheat-free Sapporo beer once a quarter in our waning years, and you harvest a unique Christmas gift for your dear ancient Auntie or the kids’ teachers out of the deal, who gets hurt? No ads, no pop-up dancing Santas, no drama… Just the quiet link, active for three months, at the bottom of each post. By the way, research (aka talking to my Mom) shows that older people really don’t want more “stuff.” What they DO appreciate are consumable items they can actually use/eat/enjoy that don’t further stress their already straining china closets or technology tolerances. Plus, they are the possibly the last generation to participate in that most wonderful institution known as “the hand-written thank-you note,” and you would be doing mankind a wonderful service by promoting this quietly fading art. Point #2: These are hand-made spelt burger buns, cooling in the the 3 p.m. patch of sunlight in our kitchen, shot with my iPhone because they were beautiful and if I had hesitated to race for The Big Nikon from upstairs, the light would have shifted and the moment lost. This image is the catalyst that began this series. 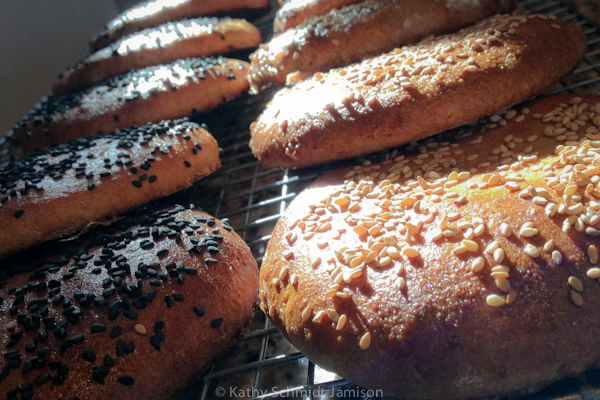 I don’t know if you’ve looked lately, but you can trust me on this: there are very few recipes out there for bread-machine produced sourdough spelt sesame-seed encrusted potato burger buns. Somewhere along the way, the bread machine got mothballed as irrelevant. Have I mentioned that Rick and I live in a small, renovated farmhouse with adequate but limited storage space? Do you have any idea how big an irrelevant bread machine is in such a space? We make frequent trips to our local thrift store. While we were there dropping off the bread machine today, Rick browsed the housewares shelf and found this (photographed with the Big Nikon in the same sliver of kitchen light as the previously mentioned buns… oooooh….). 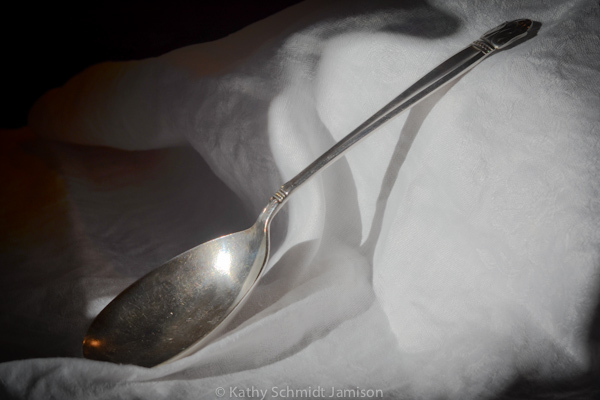 It was dirty and tarnished, at first glance hardly worth the asking price of 10 cents. But Rick and I have a high tolerance for risk, plus we’re going to have a lovely full house for Christmas, and we’re going to need another large serving spoon. 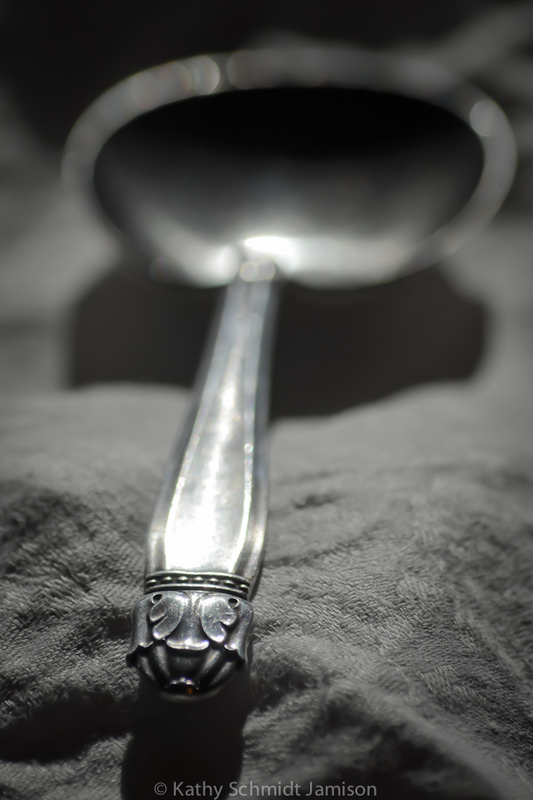 We brought it home, polished it up, and finally saw the marks of the manufacturer, “Holmes & Edwards.” Five minutes of Google-powered research later, and we are now the proud owners of a 1938 “Danish Princess” berry spoon, currently worth about $68. And if you are into such things, that photo might make a nice greeting card, right? P.S. I haven’t totally worked out the whole Pictage interface yet, plus the election results are coming in, so if you’re just dying to purchase the silver spoon greeting card set, it appears you’ll have to wait until tomorrow. Or next Saturday. Or whenever I get it figured out.